The new album, Port Chuck: Vol. 2, gives fans another dose of what they got the first time around with some of the greatest 80s rock songs of all time. What can they expect to hear this go around? Reeves: It’s a whole lot of 80s rock! It’s a lot of fun stuff on it. Burton: I do “Walk This Way” and “White Lines” on the new album. Reeves: It’s a whole record of good stuff. One thing this album features that the first one did not is an original tune, “Lost Without You.” Did you know going into this project that you wanted to include an original song? Burton: Scott and I started writing that song a while back, and we thought it would be good for Port Chuck. Then we wanted to include Bradford and Brandon in to finish writing it. We had the chorus and a verse, pretty much, and we all kind of got together and wrote the last verse. Reeves: We threw this original on the album to throw our fans a little curve ball. Everybody’s been asking for one anyways. Another song that fans have been asking for is “Hallelujah,” which Scott’s character sang on General Hospital several months back. Reeves: We did a different version of that song on this album. Everybody really, really has loved this song and it’s one that we’ve been performing live for some time. When we do it live, we do it a little differently. We recorded it on this album the way we do it live. Did you find going into the studio the second time was a little bit easier since you knew what to expect? Burton: With the first album, when we did my vocals, the first day I went home and listened to them and called them back and said we have to do that again. I didn’t think it was good. It did feel a little easier this time because I knew the songs really well, and I didn’t have to learn them. It’s amazing when you know it so well. I was telling Scott, it’s almost like a monologue in acting … you know it so well you can do what you want with it, and you’re just kind of free while you’re doing it. Reeves: We were able to incorporate more and more of an emotional take on these new songs and let our own personalities shine through on them. Do you have that similar approach when it comes to acting on the show? Burton: When it comes to acting, you need to know your stuff really well to be free in a moment. That’s the bottom line. With singing, it’s a lot of emotion, too. It’s similar that way, but when you do a monologue or are acting, you have to know the stuff backwards and forward so you’re free to act and react. You can give 10 people the same monologue, just like you can give 10 people the same song, and it’s going to be done 10 different ways, but it’s all the same words and the same music. Reeves: I think each song takes on a different character, but in acting, I think knowing your character well enough to where anything that’s thrown at you from a dialogue standpoint, you’re going to convey who you are as a character through those words. It will be different words every single day. Music is nothing new to Scott, as you spent several years in the country duo Blue County. But for the other three members of Port Chuck, it’s new territory. How have they been adapting to that kind of lifestyle? Reeves: The thing I respect the most about Steve is he’s been stepping out of his comfort zone. There are a lot of areas in music that I’m already comfortable with, but having the insecurities that I’ve grown up with – whether I’m good at something or not – I’m always thinking, “Oh, I’m not good enough,” no matter what it is. He doesn’t care. He gives it a shot. Burton: If I had like five percent of your talent, I’d be more confident. Honestly … it’s ridiculous, the talent that he has. Reeves: Don’t let him fool you. He has so much talent, especially from a lyrical standpoint. He is very poetic and is just a great lyricist. Reeves: And I wouldn’t trade those years for anything because I gained such a valuable experience! Steve and I are very hands-on with everything we do. From the bus aspect of it, I make all those arrangements out of Nashville (where he and Burton both call home). We either start here or we meet the bus wherever we are going. Then Steve generates a lot of opportunities for us. He is much better at that than I am. Burton: We advance our own shows, we book our own shows, I market all our shows … It’s a lot to deal with, but Scott already has a lot of experience with all that other stuff. With Bradford and Brandon, we just want to make it easy for them, where they can come and just focus on performing. That’s really how it should be for all performers. It just works for us. Reeves: It does give Steve and myself kind of more of an invested interest in it and more of wanting to see it succeed in a great way, because we put all this time and money into it. Your first performance as Port Chuck went down in June of 2010 during CMA Music Festival in Nashville. Singing to those size crowds was typical for Blue County, but how did the other members of Port Chuck handle it? Burton: We had two rehearsals – talk about wanting to be sick! Two rehearsals, and then we played. Oh my God! Reeves: He was so sick! He was standing back there going, “What am I doing? What am I doing?” Little did we know how it would be. It was experimental. We knew that ABC had a little area at CMA Fest. We figured that 200 or 300 GH fans would be there. That was the extent of what we really thought and expected it to be. We got out there, and there was 1,600 or 1,700 people out front. The reaction was great. Since then, it’s progressed. It’s gotten tighter, stronger and better. From the performance aspect, everybody’s comfortable in their own skin and how we act on stage. It’s becoming more and more natural. After that CMA Fest performance, we were like this is bigger than we thought it was going to be! That’s when we started thinking tours and making albums. It’s been crazy. For those who haven’t seen Port Chuck live, explain the experience fans get when they come to a show. Burton: It’s more of an event because we spend so much time with the fans before for an hour and a half, through soundcheck and just hanging with them. Then take pictures with everyone after. Most bands don’t do that unless they have to. We’ve found, now that we’ve gotten bigger and our shows have gotten bigger, places are calling to book us that want to take that all away from the fans, because they wanted us to sell straight tickets for cheap … to get 900 people in there and pack the place. For us, going bigger is not better. We want to stay at that 300 tickets level because that’s perfect for us. Reeves: It’s a five-hour experience with us. We love getting to spend that quality time with our fans … chat with them, sign whatever they want, and take pictures. Burton: It’s a cool experience. Being able to do something like this is absolutely amazing because I’ve never really had aspirations of being a rock star, but now I see why people like being a rock star [laughs]! You see guys like Van Halen go out and play those 100,000 seat places … it’s amazing. Reeves: It’s amazing to me how many people come out and support what we are doing. Burton: When we were in Staten Island, we had people chasing the bus down the road. It was like the Monkees, man! It was crazy. Reeves: We video tape on our phones sometimes when we go out on stage. It’s crazy. It’s been unbelievable. 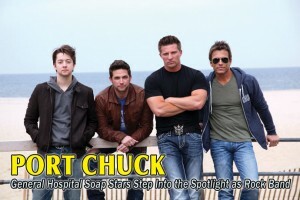 Fans can keep up with the latest tour dates and music news from Port Chuck by visiting the band’s official website, www.portchuck.com. The band’s next leg of their tour is slated for November where they will be hitting venues throughout the Midwest.